Wedge was an unmodeled and badly dilapidated 1973 walk-out Ranch with a giant dark hole occupying the entire middle of its main floor; it forced the living room to be in the basement and destroyed the home’s layout. 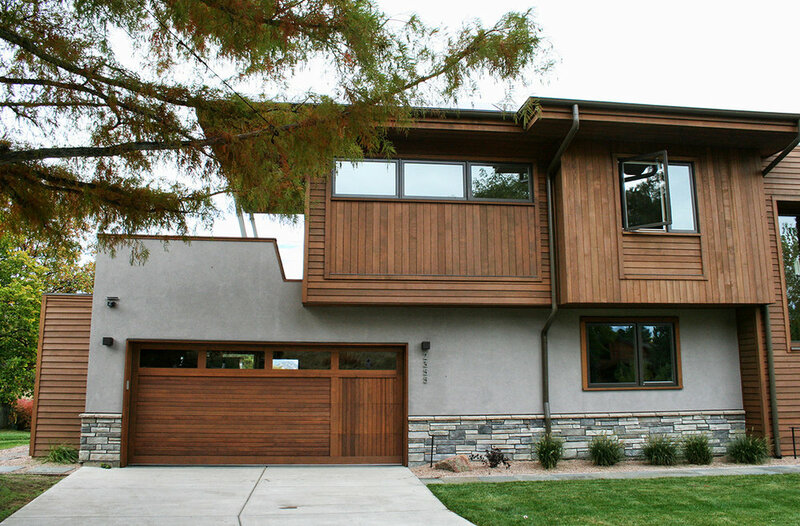 The house sits directly at the base of the Flatirons, yet had no views, no physical access or ground floor windows facing it. The home was dark, chopped up and cramped despite having over 4000 sf. of space. It’s avocado colored kitchen appliances, faux wood paneling and yellow plastic counters defined the home’s aesthetic. It’s utility bills were sky-high, and it was thermally uncomfortable. We completely gutted and reconfigured the house, leaving only the garage and basement floors, and a little bit of the framing. We filled in the hole, moved the stair and added a 2nd floor master bedroom with a private deck facing west to the mountain view. We reconfigured every room, and replaced all the house’s systems, and every surface inside and out. The final design resulted in a very energy-efficient home (HERS 31 – achieve through a combination of foam insulation, ground source heat pump, solar PV), with a bright, open and functional floor plan. The space feels expansive by flowing through quad-slider doors out to a giant new wrap-around deck that then cascades gracefully down to the backyard, Zen garden and flagstone patio seating area. 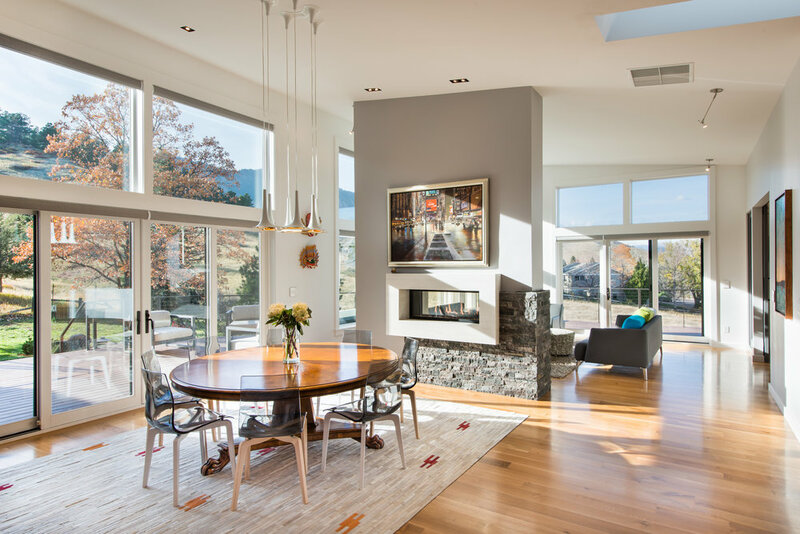 The indoor/outdoor, open concept layout is further vertically enlarged by the wedge shaped roof that opens up dramatically to fully capture the tall mountain and sky view. 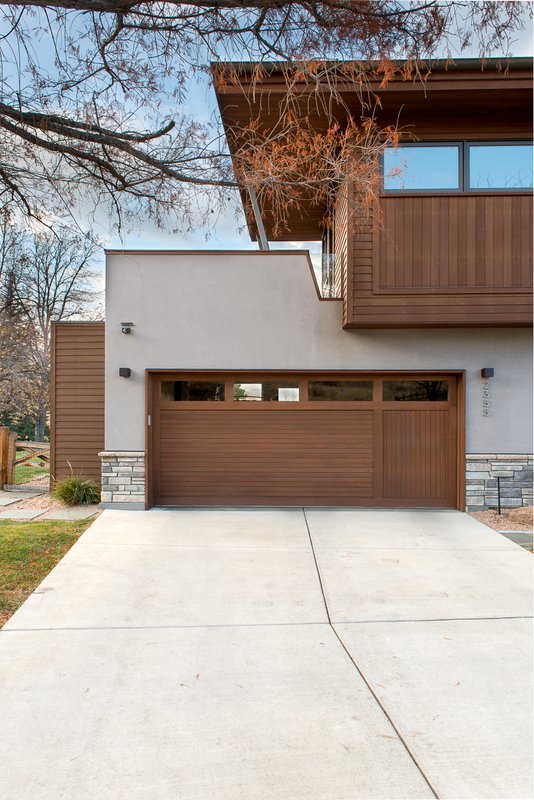 A simple palette of grey stone, stained Cedar and grey stucco creates an understated warm modern feel. We used accents of black river pebbles with a bluestone pathway and patio to provide a slight Japanese inspiration that responded to the owner’s taste. The custom off-set pivot front door invites you into a light-filled foyer. Inside, white walls, warm White Oak floors, stone, antique heirloom furniture, exquisite LED light fixtures, raw steel accents and clean lines tie the home together with a minimalist modern aesthetic. A bold open riser steel and wood stair leads you up to a modest Master bedroom. 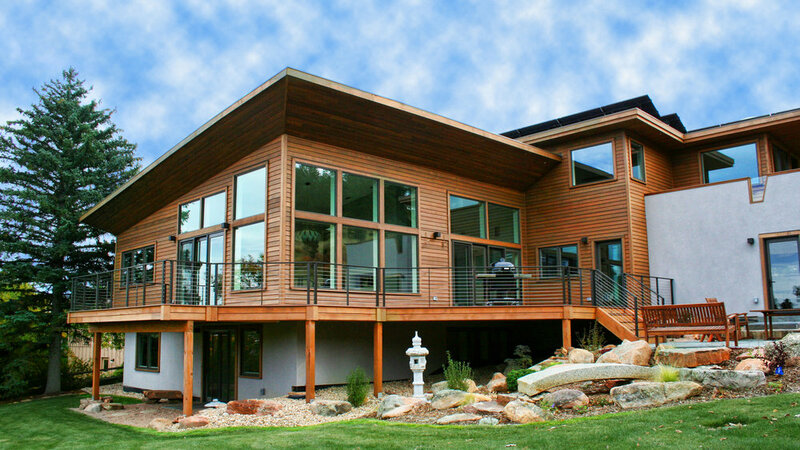 A notch in the exterior façade denotes the transition from that bedroom to its stunning private deck. The sleek gourmet kitchen opens directly into the dining and Great rooms, creating the effect of a giant glass box of light and views from every space. A see-thru gas fireplace provides organization to the spaces, and display for the family’s prized artwork without obstructing the view. The house is full of small surprises, like the built-in “bonco” (window seat niche) next to the dining room for the kids to do their homework while the parents make dinner. The vertical wine rack tucked between the fridge and freezer. The perfectly framed windows above the Master bathroom’s soaking tub, precisely balancing privacy and view. Or the home-office/music room off of the Great room hidden behind double barn doors.